The original Sherman Filterbank (Version 1) is no longer being made and is thus now completely being replaced by this new version. 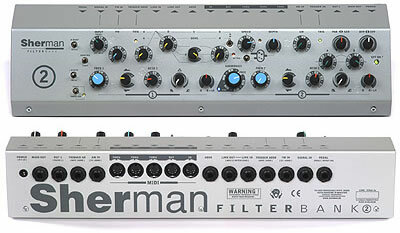 What's new with the Sherman Filterbank 2? There are 5 extra switches and 2 extra LEDs, and on the back panel there's one pedal input jack. A reworked front-panel lay-out and the grey metal colour. A 3-way switch on the input stage allows Hi boost as well Hi cut (both boosting high frequencies at input) "Limit"
An extra white LED indicates when the tracking system is "locked on"